India 5-258 (Suresh Raina 89*, Rohit Sharma 83, James Tredwell 2-54) beat England 7-257 (Alastair Cook 76, Kevin Pietersen 76, Ravindra Jadeja 3-39) by five wickets. England scored 257 runs with three wickets still in hand at the end of the allotted 50 overs. The Indian batting powerhouse smashed 258 runs for the loss of five wickets in 47.3 overs. Suresh Raina (India) was declared ‘Player of the match’ for his absorbing unbeaten knock of 89 from just 79 balls. The fourth One Day International of the series was played on Wednesday, January 23, 2013, at Punjab Cricket Association Stadium, Mohali, Chandigarh. The Indian skipper, MS Dhoni, won the toss, preferred to chase and sent England in to set a target. Alastair Cook, the English captain, came in to open the innings along with Ian Bell and they scored 12 runs in the opening five overs. Cook hit 3 fours in the next over off Shami Ahmed and Bell followed him with 2 fours in the next over bowled by Bhuvneshwar Kumar. The score was taken to 37 in 9.4 overs when Bell was caught by Kumar at third- man off Ishant Sharma for 10 runs and in came Kevin Pietersen next. 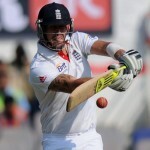 Pietersen opened his account on the 13th ball with two runs as Cook kept on cruising from his end. Pietersen was unable to hit a single boundary until the 32nd ball he faced as Cook attained his 15th ODI in the 23rd over. The first hundred of the innings was posted on board in the 26th over with a couple of fours from Alastair Cook who was declared leg before wicket off Ravichandran Ashwin for 76 off 106 balls with 13 fours. The second wicket fell at 132 and the visitors lost another two wickets after the addition of 10 runs to the score. Joe Root joined in next with Pietersen as the first was dropped by Virat Kohli off Ishant Sharma on the third ball of the 38th over when the batsman had not scored a single run. Kevin Pietersen achieved his 24th ODI half century on the fifth ball of the 43rd over with a four and hit another 2 fours in the next over. Joe Root dispatched the first six of the innings in the 44th over which resulted in 17 runs with 2 more fours. The duo hit 14 runs in the first four deliveries of the 46th over off Ishant Sharma as Kevin Pietersen was clean bowled on the fifth ball for 76 from 93 with 1 six and 7 fours. Joe Root was dropped again at 42 by Suresh Raina off Jadeja as Jos Buttler hit 1 six and 1 four on the first two deliveries of the 49th over off Jadeja and was gone on the next ball for 14. Root achieved his maiden ODI fifty on the second ball of the last over with a four and remained unbeaten for 57 from just 45 with 1 six and 8 fours as England reached 257 with three wickets in hand in 50 overs. Ravindra Jadeja was the highest wickets taker with three whereas Ishant Sharma and Ravichandran Ashwin shared two wickets each. The Blue Shirts lost their first wicket at 20 as Gautam Gambhir was gone for 10 when Virat Kohli got together with Rohit Sharma who got a life when he was dropped by Pietersen off Tim Bresnan at 12. Sharma capitalised on the chance by getting few boundaries in the following overs as Kohli hit at least three as well. The score was enhanced to 72 in 16.5 overs as Virat Kohli was caught and bowled by James Tredwell for 26 and Yuvraj Singh became the next victim for just three runs. Suresh Raina took guards at the wicket next as Rohit Sharma smashed his 13th ODI fifty in the 24th over. Sharma added 11 runs in the next over with 1 six and 1 four and the first hundred of the innings was also displayed on board. The boundaries started flourishing from the willows of both batsmen and the rival bowling attack looked ordinary. Rohit Sharma was held leg before wicket on the bowling of Steven Finn for 83 off 93 balls with 1 six and 11 fours at 158. The man in form MS Dhoni walked in next as Suresh Raina got a lucky break when he was caught in the slip at 41 but the ball was declared dead since Finn knocked the woods while bowling. The batsman punched his 27th ODI fifty in the 37th over with a four and added another 10 runs two overs later with 2 fours. The fifth wicket partnership took the score to 213 in 39.1 overs as Dhoni was caught at backward point by Eoin Morgan off Jade Dernbach for 19 runs. Ravindra Jadeja came in the park next as Suresh Raina was unstoppable at the other end. The duo saw the Men in Blue to a comfortable victory by scoring 258 runs with 15 balls to spare and five wickets remaining. Suresh Raina was at the crease with 89 off 79 mere deliveries with 1 six and 9 fours as Ravindra Jadeja secured his end for 21 runs. James Tredwell was the top wicket taker with two whereas Steven Finn, Tim Bresnan and Jade Dernbach claimed one wicket each. India won the match convincingly with a huge margin of five wickets and leads the five ODI series 3-1. The fifth and final game will be played on Sunday, January 27, 2013, at Himachal Pradesh Cricket Association Stadium, Dharamsala.